I am a lover of Bioglan products. Their superfood powders are convenient ways to fill my diet with high quality nutrients. I may have set my expectations too high for this product though, as it fell beneath my expectations. 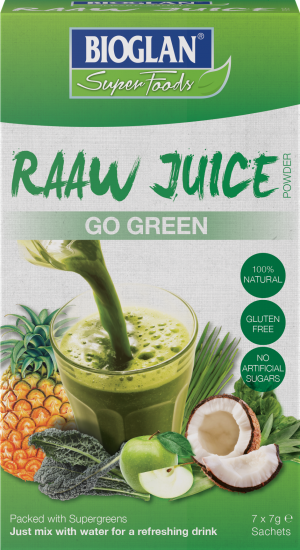 RAAW Juice comes in 4 flavours: Berry Blast, Veggie Power, Tropical Escape and Go Green. I went for Go Green as it contains pineapple, coconut and apple - it sounded yum. This juice promises to be 'great tasting'. Well, I'd like to dispute that. Perhaps I shouldn't have smelled it beforehand as it just had a very strong spinach smell to it. It tasted pretty plain but it was on the savory side. It really wasn't too nice as a drink on its own - this is what disappointed me. I had to add the other powders in the packet to juice, which makes the product quite pointless as I could have just used the Green Boost powder which I already have. I wouldn't recommend this as they are quite poor value for money compared with the other superfoods powders, considering you have to add it to juice anyway.